Special Feature: This carrier really intrigued me at first glance and it is growing on me daily! I love the feel and snuggle of the wraps but I also love the speed of the one shoulder slings. This one combines both of those features into one product - it looks like a wrap but it isn't and goes on fast like the sling! They have 8 positions, including a twin carry! There are no buckles or clasps. I usually don't like criss-cross carriers but with the wider fabric and a unique sliding lumbar band it doesn't cause the strain that the Baby Bjorn type causes. This one was designed by a mom with a special needs baby and it will also be perfect for the premature baby for Kangaroo Mother Care. This carrier has endorsements by chiropractors, physical and occupational therapists. For my approval you have to be able to nurse in it! It also comes with a bonus matching sash which is the bag to store it in also! Fabric Content: 100% Cotton w/cross stretch soft knit fabric. 100% Organic Cotton is available in two colors. Colors: Basic Black, Sage Green, Eggplant, Heather Grey and Denim are all WAS $49.95 - NOW $44.96. Nifty Shades of Grey, and Organic Natural are $59.95. Octagon Pink WAS $62.99 - NOW $56.69 The only sale ones available are on the drop down menu with their price. Small - women 4-6, men's suit jacket size up to 37"
Medium - women 8-12, men 38"-42"
Large - women 14-16, men 43"-46"
Extra Large - women 18-22, men 47"-50"
Special Sizing Tips: * Like clothing, some people may fit into more than one size. If you are larger on top, have broad shoulders, long torso, or wear bulky clothing, we recommend that you choose a larger size. If Carrier is a little loose, make sure to wash and tumble dry for a tighter fit. * If you are in the late stages of pregnancy when you are choosing your Baby K'tan Baby Carrier, you should use your pre-pregnancy top size in determining the proper carrier size. Similarly, carrier size generally corresponds to pre-pregnancy fitted t-shirt size. If in between sizes, choose a smaller size. * When you are wearing the Baby K'tan Baby Carrier (without your child inside), the bottom of the carrier should optimally fall at or around your waist, and no lower than your hips. Accordingly, if you are tall and/or have a long torso, you may need a larger size. If the bottom of the carrier falls below your hips, the size is too big; If the bottom of the carrier falls at or around your chest, the size is too small. * When you are carrying your child in the Baby Carrier, if the carrier feels too tight around you and your baby (i.e., very difficult to place baby into carrier, fabric of carrier digs into baby's legs in the adventure, hug or hip position, or fabric feels like it is squeezing you and/or your baby when wearing baby in cradle or explore position), choose a larger size. * When you are carrying your child in the Baby Carrier, if the carrier feels too loose (i.e., baby feels insecure, legs are bumping baby's body as you walk, or carrier easily slips off your shoulder), choose a smaller size. * The cross-stretch of the Baby K'tan Baby Carrier and the five different carrying positions enables the carrier to grow with your child. Accordingly, you should not require a larger size as your child grows and develops from a baby to a toddler (up to 42 lbs). * Our baby carriers are made entirely of 100% cotton knit and are not pre-shrunk. Carriers are cut slightly larger to allow for shrinkage. Wash & tumble dry before first use if carrier is too large.If you wish to exchange your Baby K'tan Baby Carrier for a different size, simply send the carrier back to us within 30 days (must be in good condition and in its original packaging). Please be aware that the Baby K'tan Baby Carrier is 100% cotton knit. These carriers are cut slightly larger to allow for shrinkage. Accordingly, before you exchange your carrier for a smaller size, you should make sure you have washed and tumble dried your carrier. This will not affect your exchange. 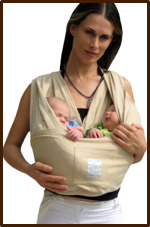 After your Baby K'tan Baby Carrier is washed and dried, it should fit you appropriately.IF, after washing and drying your carrier, there is still a sizing issue, please contact us so we can help you figure out the best size. There are a few "older" styles that don't have the bag but they do have a hat. They are on the drop down menu at a discount but will disappear when they do!